Light: Being deeply committed to a cause. Giving in to strong emotions, from excitement to depression. Acting on intuition alone. Solving problems intuitively. Believing in and basing decisions on ideals instead of realities. Bringing intuition or passion to the table. Shadow: Becoming a fanatic. Rejecting information that suggests your intuitions are misguided. Allowing your emotions to control you. Giving in to jealousy, confrontation, and peer pressure. Hiding or ignoring intuitive insights. Personality: The Knight of Cups can represent anyone who wants to lead the way (Knight) to stronger emotions and deeper spiritual understanding (Cups). The Knight may also represent the tendency to be more emotional than reasonable, or an urgent desire to experience spiritual or emotional extremes. Story: Prompted by strong emotion, the Main Character launches into action. Relationships. A desire for a Hollywood-style romance may blunt your ability to appreciate the value of everyday, garden-variety love. There’s a fine line between passion and obsession; if your relationship leaves you upset and exhausted, consider other options. Work. Beware initiatives designed to do little more than stir everyone’s emotions. Keep your own feelings in check, and don’t hesitate to ask for details. Decisions may require more than the facts. What do your wisest advisors feel about your options? Spirituality. Spirituality may incorporate extremes (speaking in tongues, intense rituals), but more modest spiritual experiences are also valid. Strive to find Spirit in everyday actions. When you do, the smallest gestures take on the aura of ministry. Personal Growth. Temper your inclination to be driven to extremes. Love can be passionate without overwhelming you. Spirituality can be deep without becoming bizarre. In all things, seek the balance of the middle ground. Fortune Telling. This card represents a man with an emotional, sensitive personality, likely born between October 13th and November 11th, who wants you to rally around his latest passionate cause. When? Between October 13th and November 11th. The Cup Held Aloft. 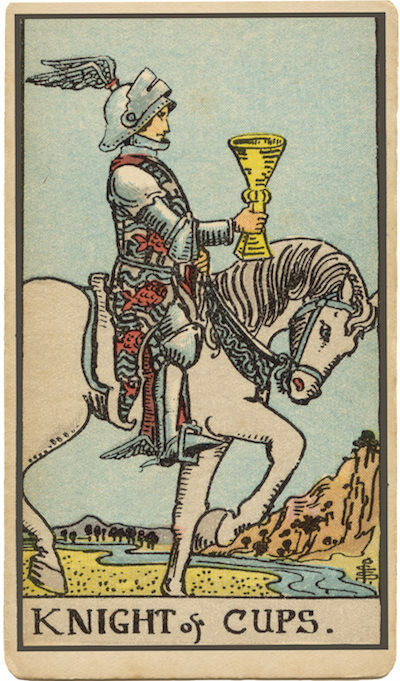 The Knight of Cups is frequently drawn with a cup held aloft—or, at least, carried reverently. Emotions are powerful; they must be treated with the utmost care. If we fail to take proper precautions, emotions will overrun our lives, drenching us in obsession and over-reaction. The Animal’s Attitude. In RWS-inspired versions of this card, the Knight’s steed looks almost contemplative. But Knights, by nature embody extremes. In times of extreme emotion, are you reflective…or berserk? Intuition and Illumination. When emotion and spirituality are combined, we become enlightened, discovering a new way of thinking, seeing, and acting. That transcendence may not be appreciated by those who feel their own light is dimmed by your personal brilliance. The Marseilles Image. The Marseilles Knight of Cups regards his Cup with trepidation, as though terrified of spilling a single precious drop from the Grail. Even his horse is on tip-toe! To what extent are you “tip-toeing” around in an effort to avoid heated confrontation? How prone to emotional extremes are you? What’s the difference in driving passion and blind zeal? How can you inspire others without inciting a riot?